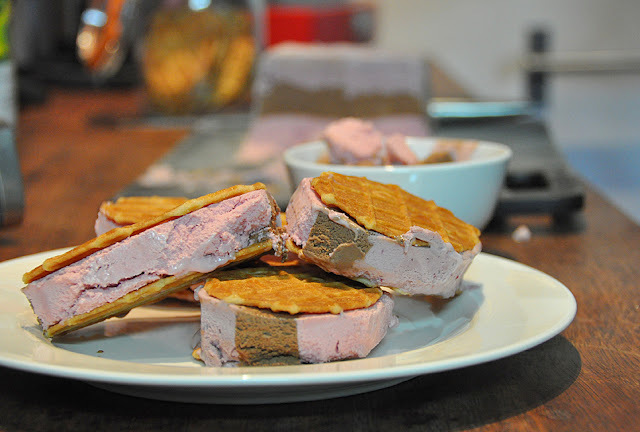 Maja Rose and Tess Lloyd of the fantabulous jewelry company Polli have shared a recipe for ice cream sandwiches with us today that I’m totally gaga about! Not only is the ice cream beautiful to look at it, but it can easily be switched up with different fruits and flavors, depending on the season. You can even change it to match your favorite color! The Polli ladies selected dark chocolate, raspberry, and blackberry in honor of Polli staff member Sherri, who was celebrating her birthday. It was Sherri’s fondness for purple that inspired the lovely color theme! What a fantastic birthday treat! I hope you enjoy it! 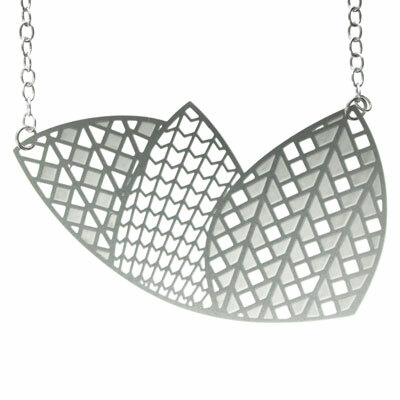 Polli is an Australian-based company that is known for its unique and contemporary jewelry, homewares, and decorations. 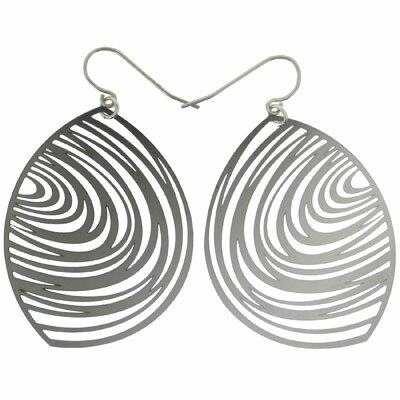 My sister first introduced me to their metal jewelry many years ago and I instantly fell in love with their fun and beautifully intricate designs. I’m currently obsessing over their fox earrings (how cute are those??) 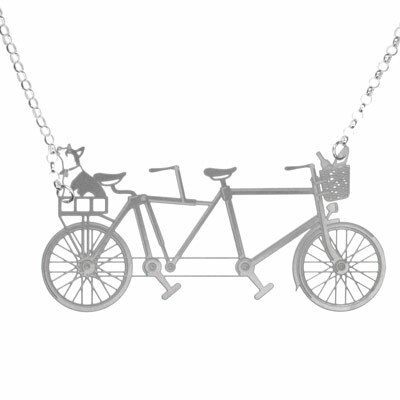 and the tandem pendant (such great details), but, really, their Web site is filled with so much eye candy that it’s nearly impossible to make a decision as to what I want to get next. I’m sure, after a quick browse, you’ll be hooked, too! Click here to check out the Polli Web site. 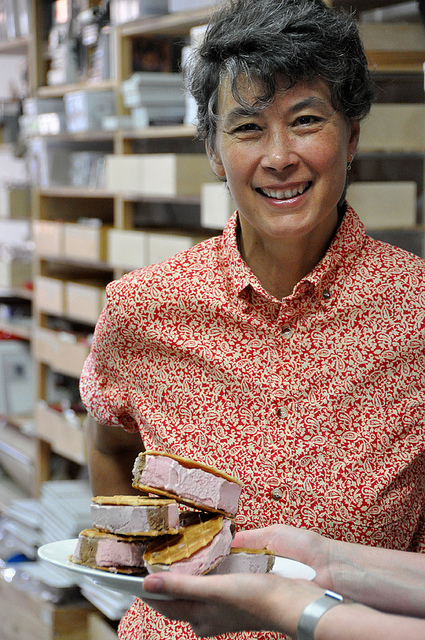 You can find the complete recipe for the I Scream Sandwiches and more photos after the jump. Thanks, Maja and Tess! Start at least one day before. 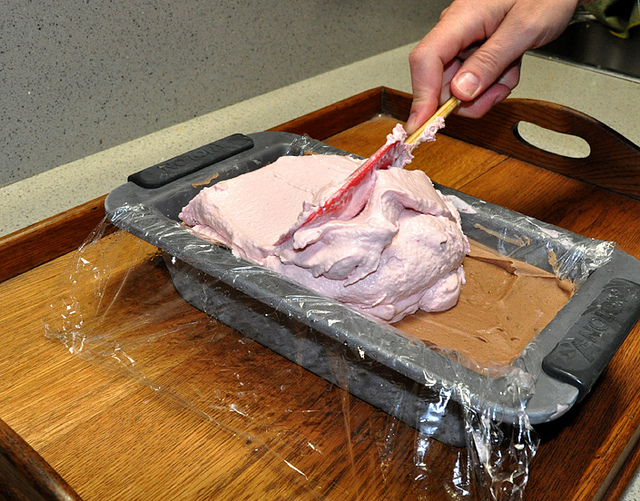 Grease a 1.5 liter terrine or loaf tin, then line with plastic wrap leaving enough overhanging to cover the ice cream, place in the freezer to chill. 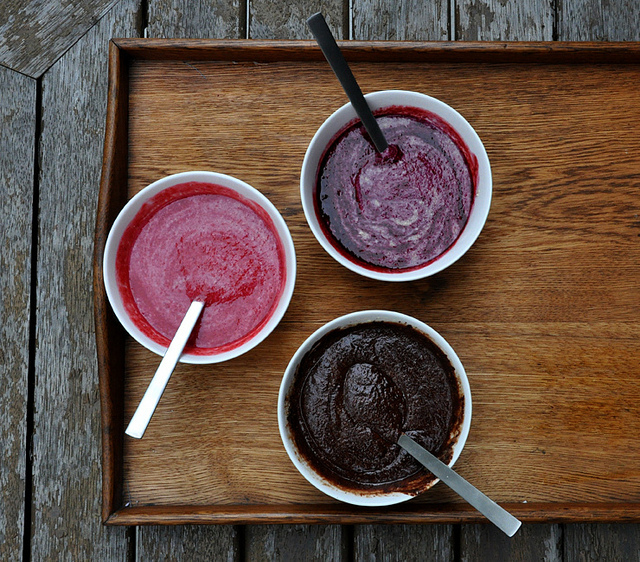 Puree the raspberries in a blender, then press through a sieve into a bowl, discard the seeds. Put aside then repeat with the blackberries. With an electric beater beat the egg yolks, sugar and corn flower until thick and pale. Place the milk in a heavy based saucepan and heat to just before boiling point. Slowly add the milk to the egg mixture whilst stirring. Return the mixture to the saucepan constantly stirring cook on low heat till the mixture forms custard, about 3-4 minutes. Divide the custard into 3 bowls, while still hot. 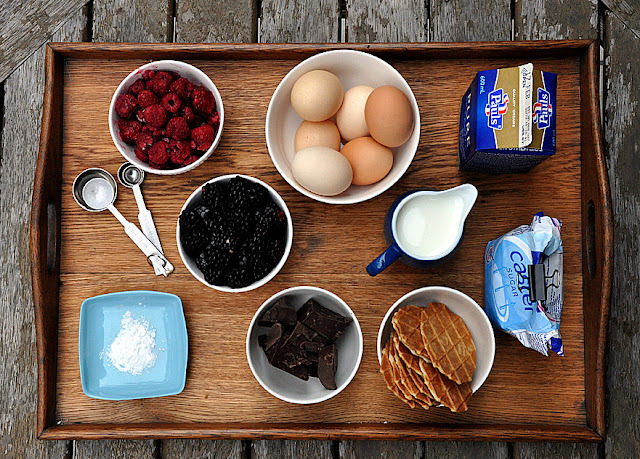 Add the chocolate to one, raspberries to the next and blackberries to the last. 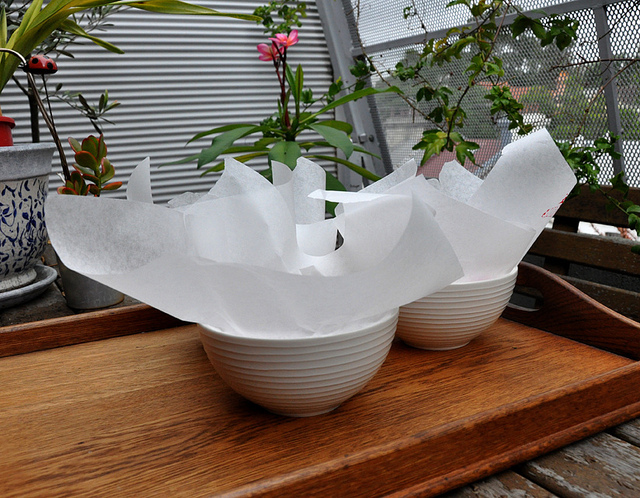 Cover the surface with baking paper so a skin doesn’t form, place the bowls in the fridge. When the mixtures have cooled whip the cream to form peaks and divide into the 3 bowls, folding into the mixtures. Churn the blackberry mixture in an ice cream maker, once the ice cream forms press into your prepared terrine, let freeze for two hours. Keep the other two mixtures in the fridge. Then churn the chocolate mixture then spread over the blackberry ice cream, allow to set for two hours, and then repeat with the raspberry mixture. Then cover with the overhanging plastic wrap and allow to set for at least 4 hours if not over night. To serve, unwrap the terrine and turn out the ice cream onto a board. Cut 3 cm thick slices then place between two butter crisps and cut any overhanging corners, put these in a bowl for latter. Serve immediately! The ice cream will keep for a week. wow! The earrings are so gorgeous! 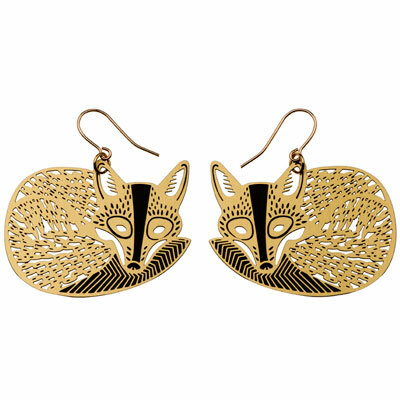 I love the fox earrings, too. And the i scream sandwich look so yummy! Such a happy post! 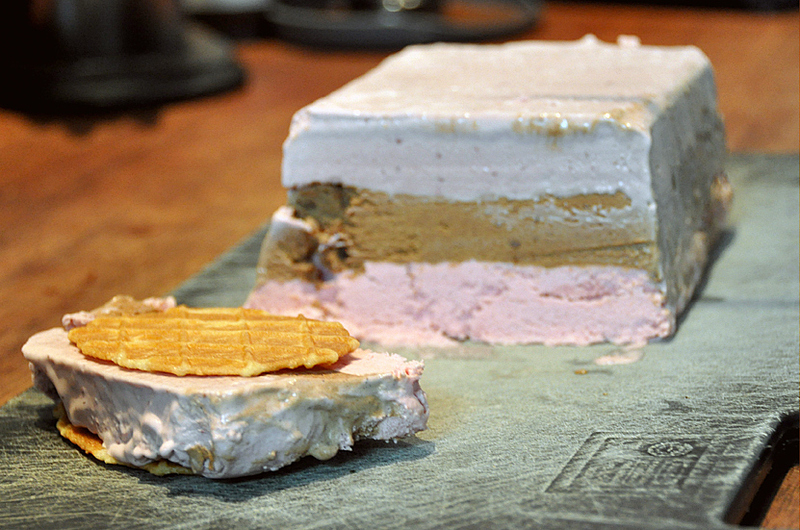 These ice cream sandwiches look wonderful & the jewelry is so pretty. I want to eat those sandwiches while wearing those fox earrings! Will you make them for me??? ?